"The first time I saw her, I knew this girl was wilder than any stallion I’d ever trained. She was headstrong, wounded, passionate and free. 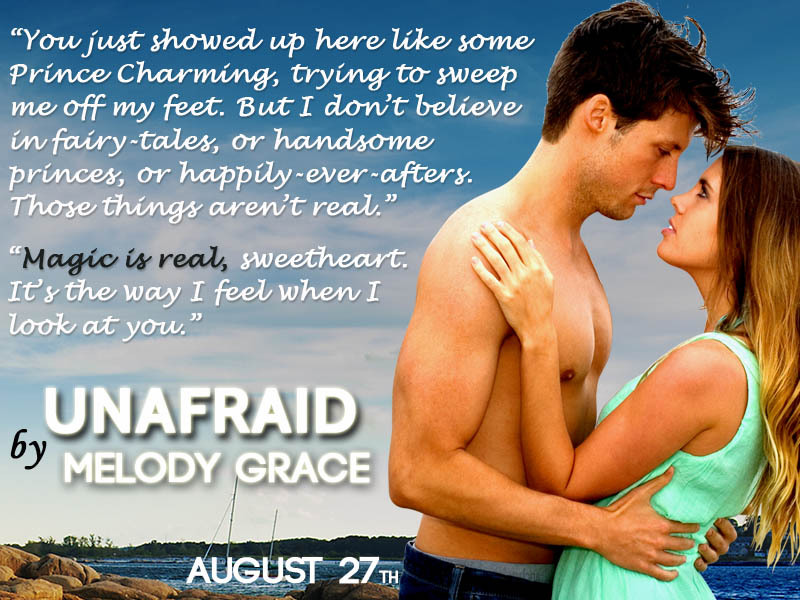 And I had to have her…"
Unafraid by Melody Grace was the perfect summer escape! This book was a quick captivating read. 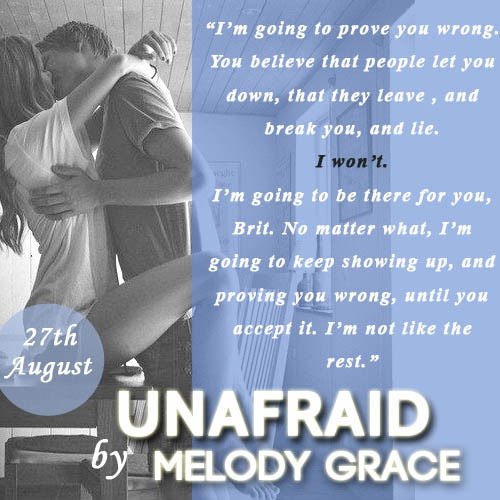 Even though there are two other books in the Beachwood Bay Series (Untouched & Unbroken), Unafraid can be read as a stand-alone without giving out many details from Emerson & Juliet's story. I love it when we get to see characters featured in previous books. You always want to know what your favorites are up to. I have read Untouched & Unbroken before I read Unafraid. 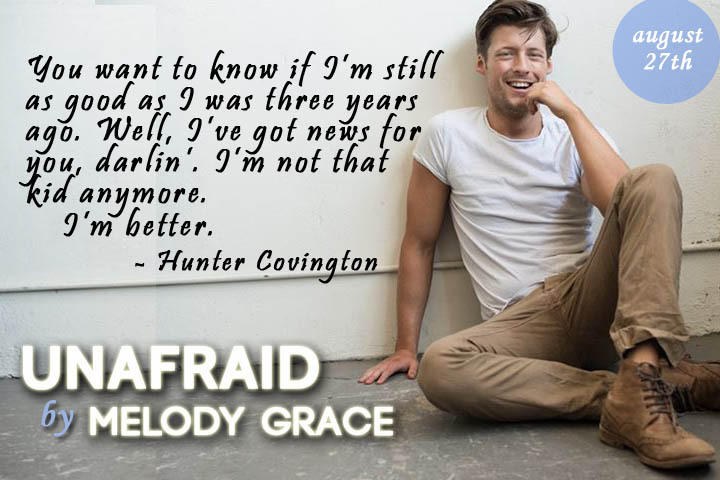 I LOVED Juliet and Emerson, but Brittany and Hunter totally CAPTIVATED me. This story was a breath of fresh air! I enjoyed the reverse situation in this book. Usually I read about the ''Bad Boy'' who falls for the ''Good Girl'', but this was different and I loved it! Brittany was very easy to love. I loved that the author included Brittany's desire to become a fashion designer to the story. Brittany works hard to make her dream come true, even if nobody is giving her a chance. The determination to finish that exquisite dress, shows how much of a strong person she is. Her town gives her a reputation and she ends up believing that she is that kind of person after hearing it so much. She's afraid of getting hurt, so she leaves any relationship before she gets invested in it. Brittany was brought up by her brother Emerson. Even if Emerson gives her all his love, she thinks that nobody is ever going to love and care for her. When Hunter comes along, Brittany plays hard to get and that makes the chemistry between them even more hotter! Once she falls under Hunter's spell, she is ready to accept that she does deserve to be loved and that she can trust somebody with her heart. I was cheering for her until the very last page. She deserved to find a man who could sweep her off her feet and make her feel what love is all about. I really enjoyed Unbroken and Untouched, and I'm sure this is good too. I really liked Brit and Hunter sounds great. So glad you enjoyed!